"Dropping a Han Dynasty Urn," (2015) is part of the "Ai Weiwei: Bare Life" exhibition. St. Louis’ Mildred Lane Kemper Art Museum will reopen this fall with a big artistic bang: an exhibition by celebrated Chinese artist and political activist Ai Weiwei. The Kemper closed last April for a $12 million renovation, part of $280 million campus project. The work significantly increases the museum’s display space. The Sept. 28 opening will feature three dozen Ai Weiwei pieces, including some created for the exhibition and others never before seen in the United States. The “Ai Weiwei: Bare Life” exhibition is an auspicious debut of the new space, according to Carmon Colangelo, dean of the Sam Fox School of Design & Visual Arts. "He might be arguably the most famous artist in the world right now," Colangelo said. 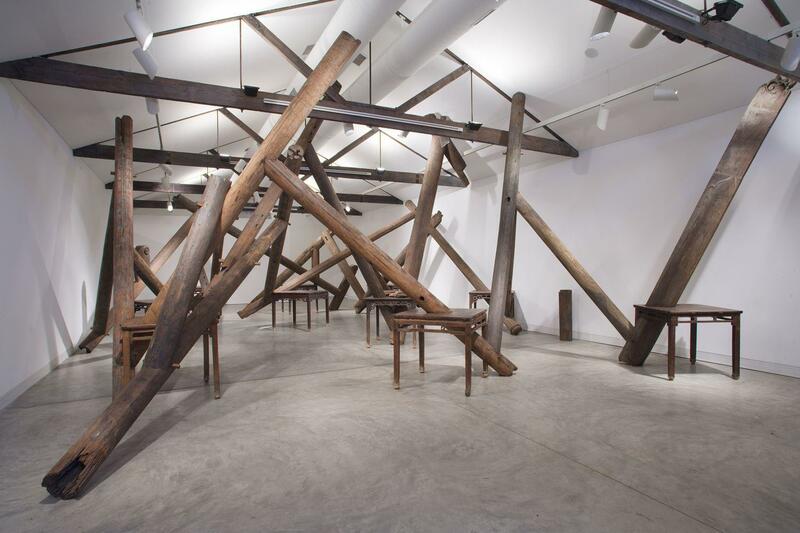 This piece called Through, 2007-2008, employs tables, beams and pillars from dismantled temples of the Qing Dynasty. Ai Weiwei, who lived and worked in the United States in the 1980s and early 1990s, has been openly critical of the Chinese government. His focus on human rights resonates strongly in today’s political climate, Colangelo said. “He speaks to issues around the globe, such as refugees, in a very poetic and powerful way,” he said. The exhibition demonstrates the museum’s desire to think beyond the Euro-centric emphasis that’s typical of U.S. art institutions. The Kemper likely will add at least one piece from the artist to its permanent collection, which already totals more than 8,000 works. “The main goal is to allow us to have more of the permanent collection on display,” Colangelo said. 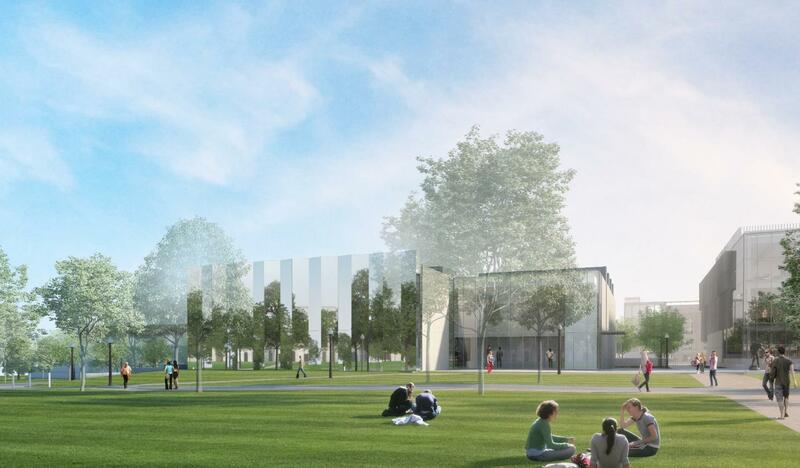 The expanded Kemper Art Museum will be defined by a 34-foot-tall polished stainless-steel facade. The Kemper is one of the oldest collecting institutions west of the Mississippi River. Founded in 1881 as the St. Louis School and Museum of Fine Arts, it was initially located in downtown St. Louis. In 1960, the museum moved to Steinberg Hall on campus and in 2006, the Kemper opened as part of the Fox School. The expansion reflects a mission of collecting and preserving modern and contemporary art for future generations while engaging students and the St. Louis region, said Museum Director and Chief Curator Sabine Eckmann, in a news release. “It will enable us to reach larger and more diverse audiences and to deepen our exhibition and collecting programs while reflecting an even broader array of both modern and contemporary artistic practices,” Eckmann said. The larger Wash U project adds a new welcome center and a building for art and architecurual studies called Weil Hall, which will include graduate studios and classrooms, as well as two stories of underground parking. The Mildred Lane Kemper Art Museum at Washington University is celebrating a decade at its permanent home with a first showing of works from its entire collection. The museum will celebrate its 10th anniversary at the university with an event Friday that will highlight its paintings, sculpture and other art. Founded in 1881, the museum’s had a long focus on European art. But in the last decade it has shifted attention to better spotlight political art. Drone warfare has spread from the battlefields to TV and movie thrillers. And now it’s spread to the fine art world. The Kemper Art Museum at Washington University is hosting one of the first museum shows critically examining drones. Yet, say the show’s curators, the art isn’t bogged down in political rhetoric. It's visually engaging and firmly grounded in contemporary art. A new gift of more than 50 artworks will expand the Mildred Lane Kemper Museum’s collection of politically conscious contemporary art. “Most of the works really have a political edge in relation, for example, to racism or feminism. There are also many works that deal with our media and image saturated society,” said the Kemper’s Director and Chief Curator Sabine Eckmann.